Andrew McNiece of Melodic Rock Records has possibly unearthed another Swedish gem in the shape of Rina. This album isn't as immediate as, say, Finland's One Desire, but it has so much maturity and layers that keep revealing themselves the more you play it. Comprising the talents of Richard Andermyr on vocals and guitar, Jan Johansson on drums and Jonas Melin on bass, these guys have done some serious time in cover groups and original bands up and down the country – for Andermyr, studying and playing in the US as well – learning their craft and gaining experience while writing original songs (in Andermyr 's case) in their spare time. After spending a year working on their début album, the result is a wonderfully crafted, mature sounding Melodic Rock gem. 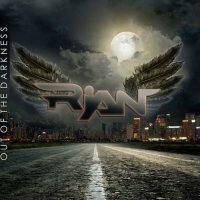 Lead-off single, the title track 'Out Of The Darkness' is typical Scandi Pop Rock with hints of Bon Jovi, whilst 'In A Dream' is a hook-laden melodic diamond that AORsters will fall in love with. The crazy thing is that Andermyr's spell in America has really influenced his writing and playing, a lot of the songs sound familiar but they still have their own uniqueness, making it hard to pin down specific influences. On repeated listens, there are definite hints, but by no means comparisons, to the likes of Dokken, Giant and White Lion. It's on the more up-tempo numbers, like the guitar-driven 'Out Of My Mind', the gritty riff-laden 'Hide Away' and hard hitting 'Pain', where they come into their own. There is so much to like and I'm guessing for many this album will be a grower as this trio have packed an awful lot of music into the grooves. For those that buy the 'Special Edition', there is a bonus acoustic version of 'In The Night' that is markedly different to the full version, the latter being a hard Melodic Rocker with some tasty guitar and a decent chorus. Andermyr has clean and smooth vocals with a subtle Vibrato and a decent range. He also plays tastefully orchestrated solos and rhythm that allow for the needs of the song rather than ripping it up just to be showy, similar in fact to what Vito Bratta used to do for White Lion. This is by no means a classic, but as debut albums go, it's definitely worthy of your attention.